More than a month into bonus time after a successful primary mission on Mars, NASA's Spirit rover has sighted possibly layered rock in hills just ahead, while twin Opportunity has extended its arm to pockmarked stones on a crater rim to gather clues of a watery past. Both robotic geologists of the Mars Exploration Rover Project remain healthy. Engineers at NASA's Jet Propulsion Laboratory, Pasadena, Calif., quickly restored Spirit from two unexpected computer reboots in May triggered by low-probability software glitches. "We had bad luck to hit two very unlikely scenarios just eight days apart, but in both cases the software team was able to figure out the problem within a day," said Joe Snyder, a Lockheed Martin software engineer on JPL's rover team. Spirit has driven more than 2.9 kilometers (1.8 miles) since arriving at Mars five months ago, more than three-fourths of that since completing its three-month primary mission. It now has only about 400 meters (440 yards) to go -- possibly less than a week of driving -- before reaching the base of a range of hills informally named "Columbia Hills," which scientists identified in January as a desirable but potentially unreachable destination for the rover. "This is the first time we've ever had a close look at hills on Mars," said Dr. James Rice of Arizona State University, Tempe, a member of the rovers' science team. 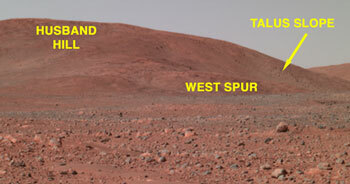 In 1997, hills called "Twin Peaks" tantalized scientists from only about one kilometer (1,100 yards) away from the Mars Pathfinder landing site. "We could only observe Twin Peaks from a distance and wonder about them, but now with a more capable rover we can get to Columbia Hills," Rice said. He spoke at a press briefing today at JPL. Rocks in Columbia Hills may provide insight both into both how hills form on Mars and whether the ancient environment at this part of Mars was wet. Images Spirit has taken as it nears the hills already show boulders and potential rock outcrops. "These rocks are much older than what we've been driving across," Rice said. "We could find a lot of geological history locked in them. They may be some of the oldest material ever seen on Mars." On the rim of stadium-sized "Endurance Crater," halfway around Mars from Spirit, Opportunity has been using its microscopic imager to examine the texture of rocks, adding information about a past lake or sea environment that also left its mark in the smaller crater, "Eagle," where Opportunity landed. "We're looking at rocks that have very interesting surface textures," said science-team member Dr. Wendy Calvin of the University of Nevada, Reno. 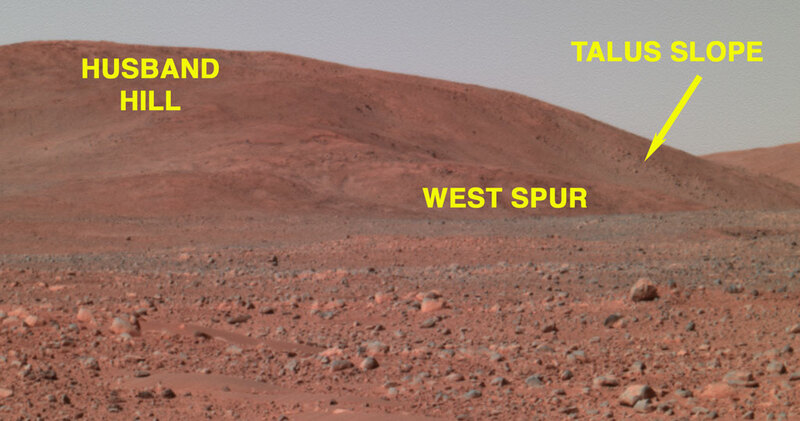 "These rocks appear to be from the same geological layer as the outcrop at Eagle Crater, but they have some differences from what we saw there." One rock called "Pyrrho" on the Endurance rim has a braided ripple pattern. Another, "Diogenes," compared with rocks seen earlier, has more of the disc-shaped cavities that scientists interpret as sites where crystals formed in the rocks, then disappeared as the chemistry of water in the rocks varied. From an overlook point on the southeastern edge of Endurance, Opportunity used its panoramic camera and miniature thermal emission spectrometer to study the inside of the crater, supplementing a similar survey made earlier from the western edge. Both instruments can be used to assess mineral composition from a distance. "We see a strong basaltic character in the sand at the bottom and in some of the rocks in the wall of the crater," Calvin said. That is a contrast to the sulfate-rich composition of the overlying layer, which resembles the Eagle Crater outcrop. "We expect the basaltic material to tell us about environmental conditions from an earlier time," she said. Scientists and engineers are evaluating the potential science benefits of sending Opportunity into Endurance Crater and assessing whether the rover would be able to climb back out. A decision about whether to enter the crater will be based on those factors. Mission controllers have begun frequent use of a "deep sleep" mode for Opportunity, reported JPL's Matt Wallace, mission manager. It is a more complete overnight shutdown that conserves energy but at a calculated tradeoff of risking damage to the miniature thermal emission spectrometer. The strategy has approximately tripled the amount of time the solar-powered rover can work during the day. So far, the spectrometer has survived, but as the martian winter advances, scientists expect to lose the use of that instrument.